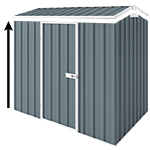 Perfect size garden shed with extended wall height to store all your gardening and backyard needs. Customise your shed to your taste, you can change the hinged doors to sliding doors add louvre window, skylight sheet, shelving, tool holders and the list goes on. When my mother-in-law passed away in January this year, I had been back and forth to my father-in-laws place in Broulee NSW helping him sort some things out. The place was a shamble with a lot of accumulated (horded) stuff in the loft of the house and in many of the rooms. It took us about 2 – 3 months of weekends to sort and run trips back and forth to the tip. 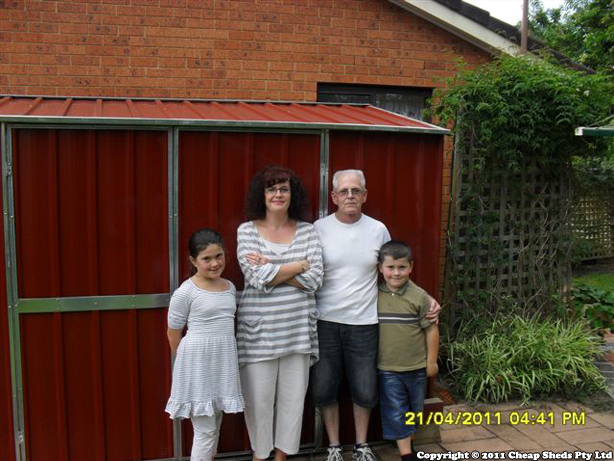 The old garden shed was rusted and falling down, so it was decided to purchase a new shed to replace it. Finding the cheap shed on line was really good, not only was the shed bigger, better and cheaper than any other that we could buy locally they also offered free delivery, this was perfect. So the purchase was made and my father-in-law, my wife and 2 kids all put in to put up the shed. As you can see it looks great with a little bit of landscaping around it (my wife’ personal touch). Thanks for all your help and a great looking shed. Easy to order, great follow-up via email (my preferred communication medium), excellent videos, well worded instruction manual. - Videos are a little "optimistic"!!!! Took longer to assemble than I thought it would. - The freight company didn't ring, I called them a week later and collected so ended up fine. Maybe get them to send an SMS and/or email in future?